Farmhouse (Currently Rented): Beautiful stone and stucco 4+ bedroom 2 full bath farmhouse. Full dining room, living room, foyer, office/bedroom, laundry and bath on the main floor. Three large bedrooms and bath on second floor. Additional loft space. Hardwood floors and millwork throughout. Fenced in backyard and charming front porch. $2700 per month. 12-Stall Courtyard Barn (Currently Rented): Courtyard style barn with 10x14' matted stalls with dutch doors to the front and back. Double wash stall, hay loft and secure storage area. Large office and tack room with separate bathroom. Includes five large paddocks with four board fencing. Ample parking. $4500 per month (includes all farm maintenance). 10-Stall Courtyard Barn (Currently Rented): Newly constructed 10-stall shedrow style barn with 12x12' matted stalls with dutch doors to the front and back and ceiling fans. 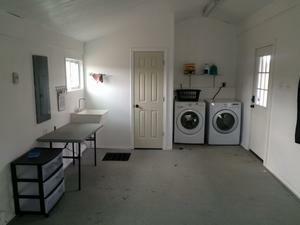 Covered washstall, insulated tack room with washer/dryer and bathroom. Includes three very large paddocks with four-board fencing. Large area for trailer parking. $4000 per month (includes all farm maintenance). 8-Stall Shedrow Barn (Currently Rented): Shedrow barn with 10x14' stalls with clay base and new safety grates to the front and dutch door to the back. Attached tack room and outside wash rack. Includes three large paddocks with four-board fencing. $2800 per month (includes all farm maintenance).